Many Dead Space fans were disappointed this week after hearing that Dead Space 3 would feature microtransactions—or, the ability to buy in-game goods for real money. Today in an interview with CVG, Dead Space 3 producer John Calhoun stated that microtransactions exist because they intend to court mobile gamers. There's a lot of players out there, especially players coming from mobile games, who are accustomed to micro-transactions. They're like "I need this now, I want this now". They need instant gratification. So we included that option in order to attract those players, so that if they're 5000 Tungsten short of this upgrade, they can have it. We need to make sure we're expanding our audience as well. There are action game fans, and survival horror game fans, who are 19 and 20, and they've only played games on their smartphones, and micro-transactions are to them a standard part of gaming. It's a different generation. So if we're going to bring those people into our world, let's speak their language, but let's not alienate our fans at the same time. 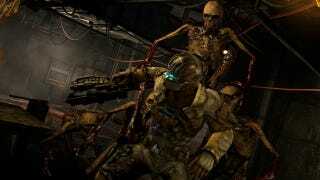 Would a typical mobile gamer be playing Dead Space 3? I don't think so, but maybe some. I think it's more likely that the people taking advantage of microtransactions in Dead Space 3 will just be impatient Dead Space players. Patience is not platform-exclusive, after all. Mobile just happened to capitalize on it early; it hasn't weaned players to suddenly expect to be able to pay for things in a game. Having that luxury is just plain attractive (to some.) No conditioning necessary. Regardless, everyone is free to abstain from purchasing anything if they want, instead opting to earn things the good ol' fashioned way.